If you know it already, you probably love it. And if you don’t know it yet, you will. 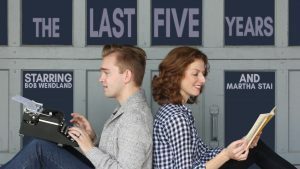 GNTC is closing the fall with a production of the wildly popular The Last Five Years. This love story follows two people (played by Good Night’s Bob Wendland and Martha Stai), who recall the triumph and turmoil of a whirlwind romance in opposite directions—one starting at the beginning, and one the end. Join us for this full-length musical favorite, featuring a live band!